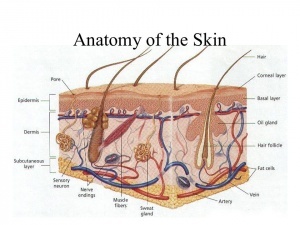 Skin is the largest organ in the body and performs a wide variety of different functions. It is composed of a predominantly cellular epidermis and an underlying dermis, which is composed of fibers of connective tissue relatively sparsely populated with cells. They play an important role in the injury of the skin. The epidermis contains mostly keratinocytes, among which are interspersed melanocytes, Merkel cells, Langerhans cells, and other resident immune cells. Keratinocytes are responsible for the production of keratin, a fibrous structural protein that contributes to the strength and waterproofing of skin. Melanocytes protect against ultraviolet (UV) light, producing melanin, the dark pigment that gives the skin its color. Langerhans cells are professional antigen-presenting cells and play critical roles in both protective immune responses in the skin and maintenance of immune homeostasis. Merkel cells have been associated with discrimination of light touch.The epidermis also contains dermal appendages, such as hair follicles, sebaceous glands, eccrine sweat glands, and apocrine glands. The dermis is the layer between the epidermis and the subcutaneous tissue. It is made up of collagen, elastic fibers, and an extrafibrillar matrix.The dermis is a highly vascularized structure . the deepest of which is the fascial plexus, located at the level of the deep muscle fascia. Overlying this, at the level of the superficial fascia, is the subcutaneous plexus. The next level is the subdermal plexus, an extensive vascular network situated at the junction between the reticular dermis and the subcutaneous tissue directly below, which has an important role in the distribution of blood to other regions of the cutaneous system. Superficial to the subdermal plexus is the subpapillary plexus, situated between the papillary and reticular dermis with capillary loops extending into the papillae. Blood flow between the subdermal and subpapillary plexus is achieved through a series of arterioles and venules and has an important role in regulation of body temperature and the metabolic supply of the skin. Wounds can be separated into open or closed wounds. In a closed wound the surface of the skin is intact, but the underlying tissues may be damaged. 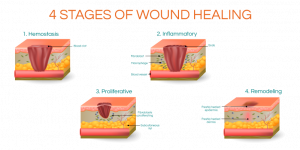 Examples of closed wounds are contusions, hematomas, or stage 1 pressure ulcers. With open wounds the skin is split or cracked, and the underlying tissues are exposed to the outside environment. 1- Wound healing can occur by primary, secondary, or tertiary intention. If the edges of the wound can be readily approximated, wound healing of superficial or partial- thickness wounds (i.e., epidermis and dermis) will usually occur by primary intention.The wound will heal through the formation of granulation tissue and reepithelialization and there should be little or no evidence of a scar. 2- When the wound covers a larger surface area and the margins cannot be readily approximated and/or tissue damage extends deeper than the dermis and into the subcutaneous tissue wound healing occurs by secondary intention. It involves wound contraction, along with angiogenesis ( formation of new blood vessels) and reepithelialization. Due to the presence of greater amounts of scar tissue for wounds that close by secondary intention, the regenerated tissues are not identical to the original tissues and only regain a portion of their original tensile strength, making them somewhat vulnerable to future injury. Wounds that heal by secondary intention should be monitored and protected until maturation of the scar tissue has occurred. 3- In wounds that contain a large degree of tissue damage, necrosis, or foreign debris, treatment may include delayed closure to ensure removal of these materials before closure of the skin. This process is known as delayed primary or tertiary healing. In adults, optimal wound healing should involve four continuous and overlapping phases: hemostasis, inflammation, proliferation, and remodeling . The first-stage wound healing concentrates on achieving hemostasis (i.e., a relatively constant internal environment) and a provisional wound matrix. In open wounds, vascular constriction and fibrin clot formation will occur to prevent further blood loss. Damage to the tissues also stimulates vasodilation with an increase in capillary permeability due to the release of histamine by injured mast cells. This will influence the release of chemotactic factors leading to leukocyte infiltration and thus the release of cytokines and growth factors, which allow the tissues to progress to the inflammatory phase. When injury to the skin first occurs, keratinocytes release a store of interleukin-1 (IL-1). This proinflammatory cytokine is important in initiating the healing cascade. Other cytokines released during the transition from hemostasis to the inflammatory phase include epidermal growth factor (EGF) and platelet-derived growth factor (PDGF), another important substance in stimulating growth and function of fibroblasts and the formation of new tissue. Neutrophil infiltration and migration of macrophages, shortly followed by lymphocyte infiltration into the wound, signal the start of the inflammatory phase. Macrophages play a central role in tissue healing through their production of growth factors, cytokines, and chemokines, which are important in the modulation of the inflammatory response. As the process of phagocytosis cleanses the wound of debris, such as denatured matrix and damaged cells, there is a shift toward the proliferative or granulation phase of healing. The focus of healing during the proliferative phase is to cover the surface of the wound and restore the vascular network through the generation of granulation tissue. This stage is characterized by epithelial proliferation and migration over the provisional matrix within the bed of the wound. As blood cells enter the site of tissue injury, monocytes are converted to macrophages with the assistance of transforming growth factor beta (TGF-β), a substance released by degranulating platelets. The macrophages release basic fibroblast growth factor (bFGF), a substance that increases the proliferation and function of fibroblasts. It is thought that macrophages also release vascular endothelial growth factor (VEGF), which contributes to angiogenesis. During the proliferative phase, reduction in the number of macrophages or impairment in function can contribute to impaired wound closure and delayed formation of granulation tissue. Fibroblasts and endothelial cells are the predominant cell types in the wound during this phase, and they support capillary growth, collagen formation, and the formation of granulation tissue. Collagen is the major component of acute wound connective tissues. During the proliferative phase, its molecules are cross-linked and organized into bundles. In addition to producing collagen, fibroblasts also produce glycosaminoglycans and proteoglycans, all of which are major components of the extracellular substance of granulation tissue. Keratinocytes and endothelial cells produce autocrine growth factors, and, in synchrony with endothelial expansion, new blood vessels are formed by angiogenesis. As the fibrin clot and provisional matrix are degraded, there is simultaneous deposition of granulation tissue. Epithelial cells migrate inward until the wound is covered. Fibroblasts are transformed into myofibroblasts. Myofibroblasts are contractile cells, so wound contraction follows, leading to the final stage of wound healing, the remodeling or maturation phase.The maturation or remodeling phase can last up to 1 year or longer post injury, particularly in full-thickness wounds and/or wounds involving larger surface areas of skin. During this time the formation of granulation tissue stops through the apoptosis (i.e., normal death of cells as part of the healing process) or exiting of macrophages, endothelial cells, and myofibroblasts. Therefore a mature wound can be classified as avascular and acellular. Collagen is remodeled into a more organized structure along lines of stress, thereby increasing the tensile strength of the healing tissues. Fibroblasts secrete matrix metalloproteinases. The enzymes facilitate remodeling of type III collagen to type I collagen, which is now organized in parallel bundles until the normal collagen ratio of 4 type III:1 type I is achieved. Intrinsic factors include :age, nutrition, and hydration levels, location and depth of the wound, medications, and co-morbidities. Extrinsic factors include: support surfaces, friction, and shear and effective repositioning schedules. Others: Dystrophic calcification, pigmentary changes, painful scars, incisional hern. Stage III, IV or unstageable pressure ulcers. ↑ 1.0 1.1 1.2 David J Magee, James E. Zachazewski, and William S. Quillen,Pathology and intervention of muscloskeletal disorders.2nd ed,2008.